Gasoline is a fantastical romp through the imagination of the one and only Dame Darcy - author, illustrator, animator, musical entertainer, and a self-proclaimed mermaid. Darcy is most widely known for her Fantagraphics published comic series Meat Cake. 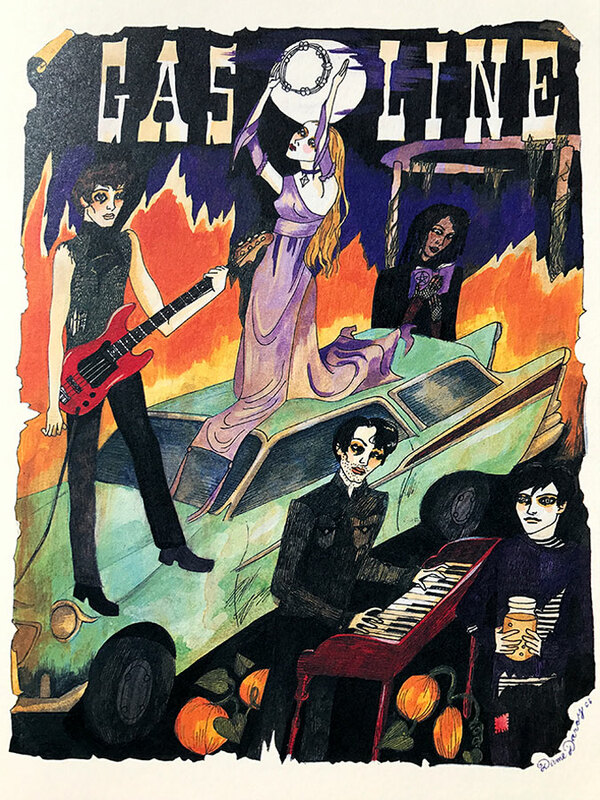 Gasoline is a 191 page illustrated novel that I admit I have not fully read, but find inspiring due to its sheer enthusiasm and unapologetic gusto for gothic magic. Darcy loves what she loves, and her vision feels uncompromised. The writing is not substantial enough for a critical adult to swallow. If I had discovered this book in high school I would have adored it. It feels like a lengthy, unresearched teenage daydream in content and style, but this is a part of the book's charm. Darcy exists in her own realm and if you are expecting more than excessive surface descriptions, is not for you. I read the first quarter of the text and decided my time was better spent enjoying the art. I love that she is so out-there, and goes with her instincts to make original striking images. This book would have worked for adult-me more if contained mostly art plates with short captions, allowing the story to be filled in by my own imagination, but like I said, this is Darcy's story - not ours. The synopsis on the back cover reads, "In a post-apocalyptic world, the search for precious gasoline pits a family of orphaned witches against conniving nihilists who lurk in the decaying urban sprawl. The family must learn to forsake a life of materialism and adopt new, alternative means of living in order to survive." I'm sure Darcy's ardent fans will love every word. As a creator trying to put work out into the world and not be daunted by my own inner critic, I find her output gives me a mental boost. Nothing is stopping her from her own romantic Big Magic.